Today, more than ever, a Scarab Offshore boat is considered with diligence, designed with passion, and produced with the premium quality and dependability consistent with the name. If you’re after the big fish, these models will put you ahead of the game. Set yourself up with this American icon: the Scarab from Wellcraft is ready for fishing excellence. From the T-top—equipped with gold-tone rod holders, two spreader lights, an electronics box, and PFD storage—to the transom rigging station, this vessel is quality from bow to stern and starboard to port. The head compartment and the cockpit are loaded with storage areas so you can keep things ship-shape. 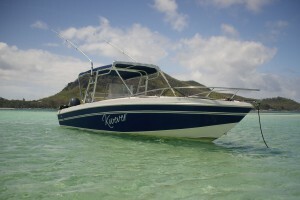 Wellcraft’s Scarab is all about high-performance fishing !